Roman History has – just like an elephant – wrinkles. But – unlike an elephant – Roman History forgets and fudges it’s embarrassing blemishes. Historians generally agree the Romans first encountered war elephants in 280 BC. 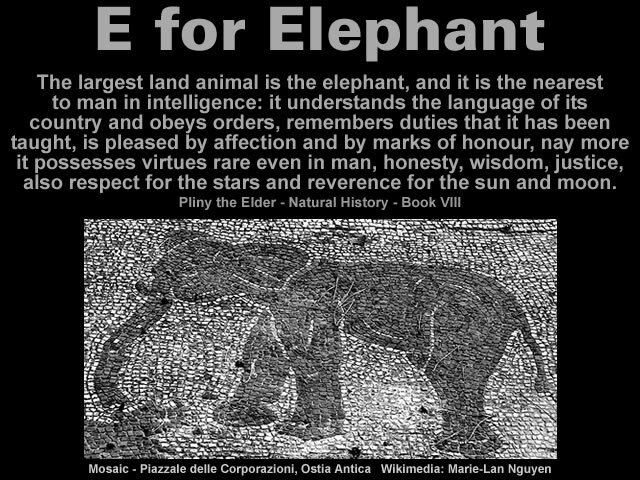 Romans first encountered the elephant in 280 BC. Pyrrhus had transported twenty of the beasts to Italy by ship and, at the Battle of Heraclea, the unfamiliar animals routed the Roman cavalry; “their horses, before they got near the animals, were terrified and ran away with their riders” (Plutarch, Life of Pyrrhus, XVII.3). King Pyrrhus of Epirus brought twenty elephants to attack the Romans at the battle of Heraclea in 280 BC, leaving some fifty additional animals, on loan from Pharaoh Ptolemy II, on the mainland. But there is less agreement about whether the Roman encounter with war elephants in 46 BC was their “very ‘final’ appearance” or just the “last significant use of war elephants”. While the use of elephants in ancient warfare has attracted considerable attention, scholarship has naturally tended to concentrate on the Hellenistic period, and few studies have extended beyond the Punic Wars, fewer still beyond the very ‘final’ appearance of elephants on the battlefield of Thapsus in 46 BC. By the time of Claudius however, such animals were being used by the Romans in single numbers only – the last significant use of war elephants in the Mediterranean was against the Romans at the battle of Thapsus, 46 BC, where Julius Caesar armed his fifth legion (Alaudae) with axes and commanded his legionaries to strike at the elephant’s legs. Between 280 BC and [about] 100 AD the Syrian and North African elephants became extinct. 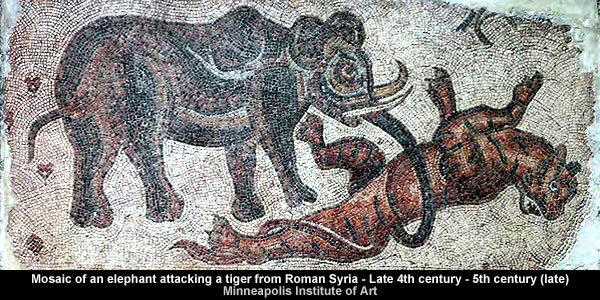 This overhunting of Syrian elephants for ivory ultimately resulted in their extinction by around 100 BC. The North African elephant was a subspecies of the African bush elephant, or possibly a separate elephant species, that existed in North Africa, north of the Sahara, until becoming extinct in Roman times [circa 100 AD]. These were the famous war elephants used by Carthage in the Punic Wars, their conflict with the Roman Republic. The narrative implies the elephant extinctions are attributable to human barbarism. During the reign of Augustus, Roman circus games resulted in the killing of 3,500 elephants. Elephants also featured throughout the Roman campaign against the Celtiberians in Hispania and against the Gauls. Famously, the Romans used a war elephant in the invasion of Britain, one ancient writer recording that “Caesar had one large elephant, which was equipped with armor and carried archers and slingers in its tower. When this unknown creature entered the river, the Britons and their horses fled and the Roman army crossed over” – although he may have confused this incident with the use of a similar war elephant in Claudius‘ final conquest of Britain. However, after the Syrian and North African elephants became extinct, there is “plenty of evidence” in Roman History that war elephants were resurrected from extinction. Scullard’s standard work on the elephant in the Greco-Roman world concludes with a professedly cursory treatment of late antiquity. This is despite the fact, recently asserted, that there is ‘plenty of evidence’ for the regular deployment of war elephants at least up to the late sixth century. More specifically, the narrative includes a third-century resurrection ‘revival’ of war elephants. Scullard identifies a Sasanian third-century ‘revival’ in the use of war elephants, which are nowhere reported in Parthian armies. Certainly Roman source begin to mention elephants more frequently from the reign of the first Sasanid Ardashir I (224-241), implying that they had again become a military issue. The Historia Augusta mentions Persian elephants in the context of Severus Alexander’s eastern campaign of 231. However, the figures reported for elephants are undoubtedly fantastic – of the 700 beasts fielded by the Persians the Romans slew 200, captured 30, and lead 18 in triumph in Rome. At last he routed and put to flight this great king, who had come to the war with seven hundred elephants, eighteen hundred scythed chariots, and many thousand horsemen. Thereupon he immediately returned to Antioch and presented to his troops the booty taken from the Persians, commanding the tribunes and generals and even the soldiers to keep for themselves the plunder they had seized in the country. First of all, there were seven hundred elephants provided with turrets and archers and great loads of arrows. Of these we captured thirty, we have left two hundred slain upon the field, and we have led eighteen in triumph. Along with this third-century resurrection ‘revival’ of war elephants is a re-written re-run of the Parthian Wars with the main protagonist being re-cast as the Sassanian Empire. 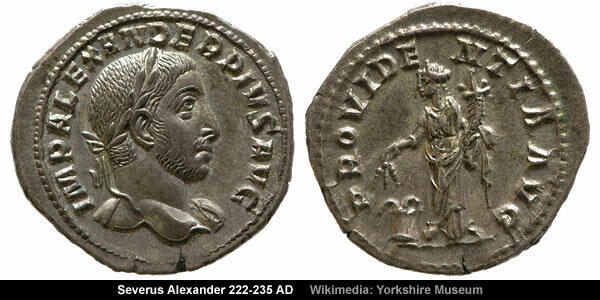 Severus Alexander (Latin: Marcus Aurelius Severus Alexander Augustus; c.207 – 235) was Roman Emperor from 222 to 235 and the last emperor of the Severan dynasty. Making Antioch his base, he organized in 233 a three-fold invasion of the Sassanian Empire; at the head of the main body he himself advanced to recapture northern Mesopotamia, while another army invaded Media through the mountains of Armenia, and a third advanced from the south in the direction of Babylon. The Battle of Samarra took place in June 363, after the invasion of Sassanid Persia by the Roman Emperor Julian. A large body of cavalry and elephants then fell on the center of the Roman left wing, commanded by Anatolius. In 53 BC, Crassus led an invasion of Mesopotamia, with catastrophic results; at the Battle of Carrhae, Crassus and his son Publius were defeated and killed by a Parthian army under General Surena. In 114, Trajan invaded Armenia, annexed it as a Roman province, and killed Parthamasiris who was placed on the Armenian throne by his relative, the king of Parthia, Osroes I.
Trajan was the first emperor to carry out a successful invasion of Mesopotamia. The originators of the Roman History narrative employed their creative writing skills to conjure up the Sasanian Empire out of thin air. The Parthian Empire (247 BC – 224 AD), also known as the Arsacid Empire, was a major Iranian political and cultural power in ancient Iran and Iraq. The Sasanian Empire, also known as the Sassanian, Sasanid, Sassanid or Neo-Persian Empire (known to its inhabitants as Ērānshahr, or Iran, in Middle Persian), was the last kingdom of the Persian Empire before the rise of Islam, and was named after the House of Sasan; it ruled from 224 to 651 AD. And – just like the Crisis of the Roman Republic – the originators of Roman History created the Sasanian Empire to fudge the catastrophic Arabian Horizon. The crisis of the Roman Republic refers to an extended period of political instability and social unrest that culminated in the demise of the Roman Republic and the advent of the Roman Empire, from about 134 BC to 44 BC. Furthermore, it’s evident, the Roman Empire narrative fudges the fact that Rome and the Roman Republic disappeared under dirt and debris at the Arabian Horizon. A less charitable interpretation of the data suggests the entire Roman Empire narrative is creative fiction that incorporates convenient characters and available artefacts from Greek Republics scattered across Europe and around the Mediterranean Sea. Ironically, the “foolish” Roman Empire narrative has been built upon sand. 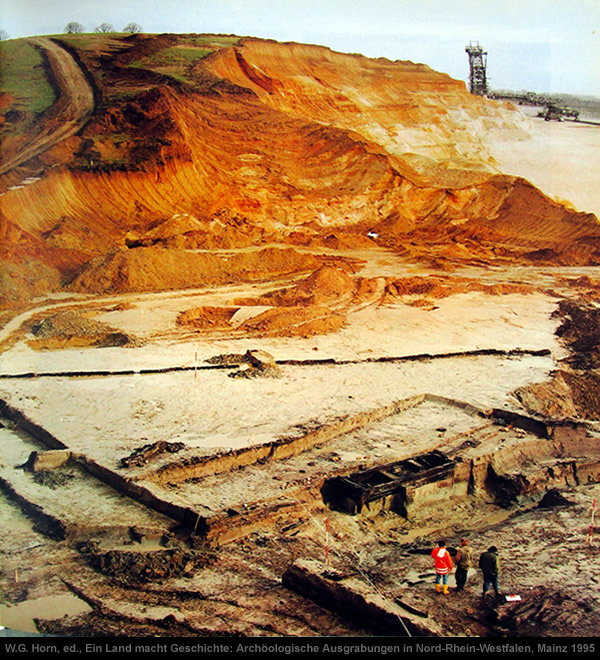 Ewald Ernst then delivers his bombshell [with photographic evidence] that a Roman aqueduct was discovered [near Cologne] buried under seven metres of sand and gravel. This sand [layer] also helps explain the extinction of the Syrian and North African elephants. Perhaps, one day, Roman History will be as reliable as an elephant’s memory. I’m not holding my breath. Gallery | This entry was posted in Arabian Horizon, Epigraphy - Inscriptions, Heinsohn Horizon, History, Old Japanese Cedar Tree, Roman Chronology. Bookmark the permalink.